Registration: On site, all day. Free Admission. Strategies of the intra- and extralinguistic nation-building in some former Soviet republics. The bilingual experience of Mr. Kawaguchi: I’m Deaf since I was an infant. What is my mother tongue? 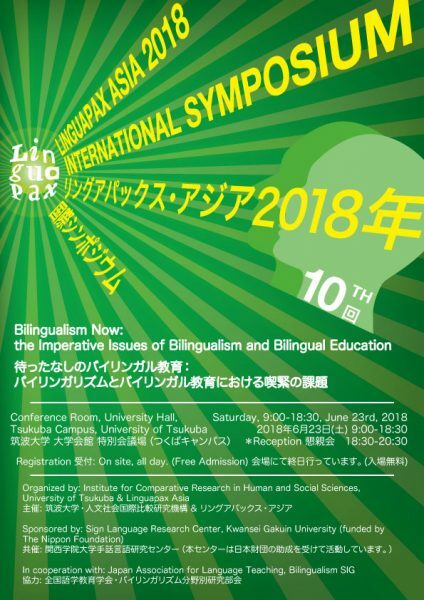 Owen Minns, Anglia Ruskin University, U.K.
Yoko Miura, Wright State University, U.S.A.
How they conduct their lives with two or more languages; A life story approach in understanding meaning-making of languages in bilinguals’ lives.